Our Boston personal injury lawyers who represent patients with knee replacement-related injuries know that these matters can be confusing to patients who may already have been the victim of inappropriate medical advice. A new report from CBS examines whether doctors are performing more knee replacements than are medically necessary. A recently released study in a peer-reviewed medical journal found that more than 33 percent of all knee replacement surgeries performed in the United States were not medically appropriate in terms of risks to patients versus medical benefit. The five-year study was partially funded by the National Institutes of Health (NIH). It looked at 175 patients who had total knee replacement surgery. The average age of study participants was over 65 years of age and more than half of the patients were women. Study criteria involved pain levels, range of motion, x-rays, and the age of patients. The study looked at whether the decision to perform a knee replacement was appropriate, inappropriate, or that a determination could not be made. The latter category occurred when the risks were equal to the benefits of the operation. The study found that just over one-third of all the total knee replacements performed were not medically appropriate based on study criteria. There a variety of reasons doctors recommend knee replacement procedures when they may not be medically necessary. A lot of it unfortunately comes down to the fact that, when a doctor performs a knee replacement, the doctor, his or her practice, the hospital, rehabilitation center, home healthcare workers, and especially the medical device manufacturer, make money. It should come as no surprise that medicine is a big business in the United States. The problem is further compounded by the fact that knee replacement manufacturers have pushed their medical devices through accelerated FDA approval procedures while minimizing known risks. Some of these risks include death, infection, nerve damage, and even a complete failure of the artificial knee. This can lead to a lifetime of pain and suffering, a loss of mobility that is far greater than what the patient experienced prior to the surgery, emotional distress, and often the need for a second surgery to replace the artificial knee with another one. Patients experiencing complications after a knee replacement surgery may be entitled to financial compensation. 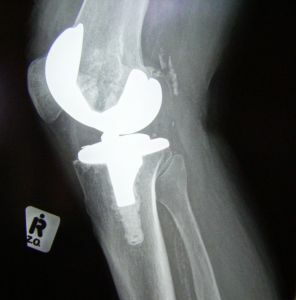 This is especially true if the patient requires a second operation to correct or replace the artificial knee. One of the most important things a patient in the Boston area who has experienced problems after a knee replacement should do is to seek a consultation with an attorney who regularly represents patients with these types of injuries. A medical products liability negligence action involving a knee replacement is a very complicated matter. Having an attorney who has experience with this specific type of case and is up to date on the latest medical research and court decisions involving knee replacement lawsuits gives victims the best chance to receive a fair and appropriate financial recovery.